Before moving to Israel I had never considered making my own graham crackers (similar to digestive crackers for you Brits). But, like so many products from home, they are unavailable here. And so, like many of my favorite take-out meals, I set out to make them at home. Graham crackers have an interesting history. According to Wikipedia (so, you know, grain of salt), they were invented in 1829 as “Dr. Graham’s Honey Biskets” by Reverend Sylvestor Graham. It was all part of a bland diet that he marketed to try to suppress evil carnal urges (the same theory, by the way, behind Kellog’s corn flakes). This entry also says that you don’t technically have graham crackers without graham flour, another invention of Reverend Graham. So if you want to be technical, I didn’t make graham crackers since graham flour is not widely available outside the United States. But you could have fooled me. Making graham crackers turned out to be easier than I thought. There are lots of recipes out there. Alton Brown‘s looks pretty authentic as it does indeed call for graham flour. Although Deb of Smitten Kitchen and Heidi of 101 Cookbooks both swear by Nancy Silverton’s recipe, for some reason I couldn’t trust one without molasses. To me the flavor of a graham cracker is akin to crispy gingerbread that’s been sprinkled with cinnamon-sugar, and that requires molasses. I ended up going with the recipe I’d been eyeing from the beginning, from an incredible book called Jam it, Pickle it, Cure it and Other Cooking Projects by Karen Solomon. Seriously, I love this book. Go buy it. You won’t be sorry. Solomon uses both whole wheat and all-purpose flour to replicate the taste and texture of graham flour, which worked for me. To that she adds cold butter, honey, molasses, sugar, milk, and vanilla. It’s all combined into a very stiff dough that’s rolled out nice and thin and cut into squares, rectangles, or whatever shapes you want. It’s no more work than making any other kind of cookie, and in the end people are imminently impressed that you made something they’ve only ever seen in a box on a supermarket shelf. Even better, it tastes like the real thing! Be careful to roll out the dough evenly and try not to have it thicker than 1/4-inch. Although they’re still good, thicker crackers don’t get the same nice crisp around the edges. These make great gifts (yes, wrapped with a cute bow) and also fulfill my New Year’s resolution to start making more diy food items at home. 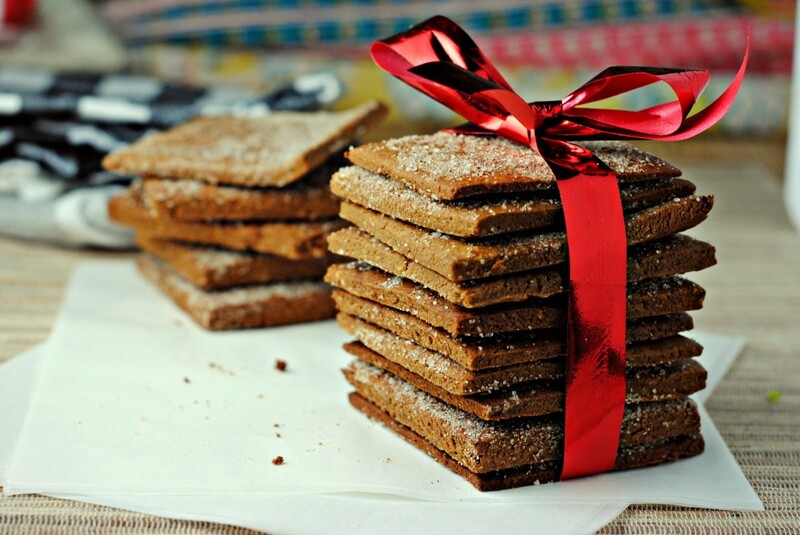 Homemade graham crackers are easier than you think and taste even better than the store-bought version. Put the flours, salt, and baking powder in a large bowl and mix together until well combined. Using a pastry cutter or food processor, cut in the butter until the dough is the consistency of coarse crumbs. Add the honey, molasses, and ⅓ cup of the sugar and combine. Add the milk and vanilla and work to bring it into a stiff dough (it will be slightly crumbly but should hold its form). Line two baking sheets with parchment paper or Silpats. Set aside. In a small bowl combine the remaining 2 tablespoons sugar with the cinnamon. Set aside. Split the dough in half. Shape the first half into a rectangle and put in the center of a piece of parchment paper. Lay another sheet of parchment paper over the dough and roll out, trying to maintain a rectangle, until ¼-inch thick. Cut the dough into the sizes/shapes you want (a ruler is handy here). Lightly prick all over with a fork. Sprinkle evenly with half the cinnamon-sugar and roll gently into the top of the dough with a rolling pin. Re-cut if necessary. Using a spatula, carefully transfer the crackers to the prepared baking sheets, leaving a bit of space in between each. Repeat with the remaining dough and cinnamon-sugar. Freeze the crackers for 15 minutes. Cool completely and enjoy. Crackers can be stored in an air-tight container for 2 weeks or in the freezer for 2 months (allow to thaw for 2 hours before eating). I have made the 101 Cookbooks version, but this sounds better. I may just have to make some more. Graham crackers went on sale so much before the holidays, that I stocked up, but when the boxes are gone it will be back to homemade. I just made these, they were delicious and very easy! When I was a kid , I always thought of Graham crackers and milk as such a comfort food. I can understand why you missed them and had to make them. I love how you tied them up in a pretty red ribbon! They are totally comfort food Judee! You are so right. Thanks so much! Makes me hungry for a graham cracker, which I admit I will never in a million years make. I have decided I am a disaster when it comes to baking anything that requires paying attention! I’ve been wanting to do this for so long, these are beautiful, Katherine! Thank you Cassie! Let me know how they come out, I hope you enjoy them! That’s exactly why I had to make them! They were relatively easy to do, and I’ll definitely making them often. I hope you enjoy! Happy New Year Katherine! I never tried them, now its a good time to start making them! Although living in England I now can find graham crackers they are so expensive so this is wonderful. I really miss my American foods. I know what’s it’s like to miss American foods that are either too expensive or not available! Funny the things we end up missing too. Anyway, this is the perfect solution! Never had a graham cracker in my entire life, but these cookies look amazing! Oh wow! Yes, I suppose they are a very American thing. I think anyone would find them delicious, whether you’re nostalgic for them or not! They would be great with tea. When I’m in the mood for something comforting and mildly sweet, homemade grahams are my go-to. Favorite way to enjoy is graham cracker mush, an “invention” of my grandfather: break up several crackers into a bowl, top with milk, let sit a minute or two until slightly mushy, and enjoy! Graham cracker mush sounds strangely comforting and delicious! Wow. These look delicious! I am so impressed that you made homemade graham crackers. Happy New Year! Yum! I wish you sell them.. These look so yummy!! Haha thanks Kiran! Happy new year 😀 Hope you’re feeling better! Yes, I’ve heard they’re hard to find in your parts. These would be perfect for graham cracker crust! Just crush them up. Yum – great idea! Kudos for doing this! No one makes their own graham crackers! But when they’re not available for purchase, what other choice have you? And I knew all about Graham and his obsession with, among other things, “carnal evil urges” but had forgotten all about that! Thanks for the memory refresh! Haha thanks! It’s amazing what living abroad has caused me to make. And I’ve realized how many things I took for granted are so American. The story about Graham is a funny one – all those guys (like Kellogs) who invented many foods we eat today were obsessed with that stuff. You are so right! Homemade is so often so much better than store-bought. Who knows how long those crackers have been sitting on those shelves? I need to make my own savory crackers soon too. Thanks MJ! Graham crackers are not something that I normally eat (or is it for everyone too?). I’m impressed that you make these for scratch. Your smores taste extra good because everything is made from scratch. I wish to have a piece of this DIY desserts! I honestly didn’t eat graham crackers a ton growing up, but I always liked being able to grab a box either to make graham cracker crust for pies or, of course, for s’mores around a campfire! Thanks for the recipe! I have made graham crackers before but this recipe is by far the best! I like my crackers on the thick side but have always had to choose between thick and chewy or thin and crispy. I love that these can be fairly thick and still crisp. Perfect! My boys love them too. I am currently in Israel and already missing my American goodies. I had a thought to make S’mores with my fiance on his birthday, but how is that traditionally possible without graham crackers?! Thank you so much for posting this recipe. For extra tasty… add a 1/2 tsp more cinnamon, and add 1/2 tsp ground ginger and 1/4 tsp mace. The ginger adds zing and the mace adds mystery. I refuse to buy graham crackers from the store but needed graham cracker crumbs for our cheesecake. I made your recipe this morning so easy!!! The graham crackers came out delicious!!!! Makes a nice size batch to munch on with a cold glass of milk. I reduced the baking time my oven is hot so 15 minutes was a charm. Thank you so very much Katherine for sharing your recipe.